In the first chapter of “Game of Thrones,” George R. R. Martin shows us Lord Eddard Stark. We see Stark through the eyes of Bran, his young son, who has just witnessed his first beheading. Though there are several characters in this first chapter (Eddard, Jon, Robb, Theon, Jory, Hullen, Harwin, Desmond, and the man being beheaded), the only suitable descriptions go to the man getting his head lopped off and, more notably, Lord Eddard Stark. In a world as vast as Westeros, there are bound to be a large number of characters in any given scene. This can be very difficult for the reader who has only just started the story. George handles this well by focusing the reader’s attention on those who matter most in this scene. Had he gone through with detailing every character listed above, the characters of importance would have been confused and forgotten. I can understand why he chooses to describe the man being beheaded. We have to remember that this scene is being told through the eyes of a young child. It makes sense that Bran would be curious of this strange man, despite the fact that this is the last time we would be seeing him. 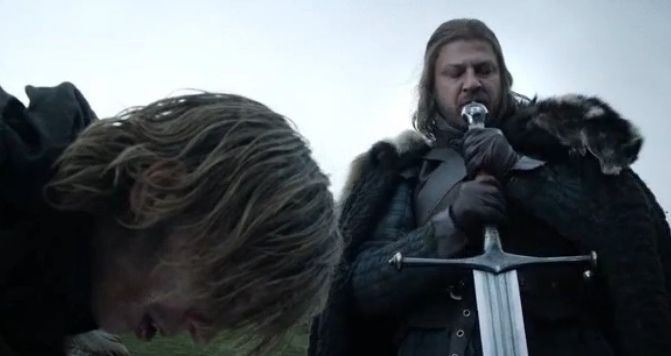 Likewise it makes sense that he would then focus on his father, Eddard Stark. This is the man he looks up to most, and it is sensible that he would be observing his father after such a gruesome event. As a writer, it is important that we understand the challenges of our craft. George had to make choices here in who he would and wouldn’t describe. He kept the reader in mind, knowing that it would be very hard for us to keep track of so many characters. Also, he kept the viewpoint character in mind, showing us only those that would stand out in Bran’s thoughts. Bran may have seen several people there, but he only really cared for two at that time. When I was reading Game of Thrones I didn’t notice the lack of descriptions of all the people there rather my mind just filled in a sort of generic young man for each of the boys present. It is amazing just how much you can learn from the masters by breaking down their works and seeing just how they were constructed and why it was done that way. It’s amazing how much I missed the first time I read A Game of Thrones. I think that is what makes his books so much fun to re-read. There’s always something new. Nice blog post. Food for thought. I’m currently working on a novel that will very likely need that kind of attention. Thanks for your insight into why you think George Martin did things the way he did. It probably will come in handy for me.